Guns N’ Roses guitarist DJ Ashba is sharing an update on the band’s plans for 2015. GNR’s last album was 2008’s “Chinese Democracy”, a project that was more than 15 years in the making; the band has been on tour almost constantly since its release. Last May, Axl Rose sharing his own update on new music by his band. 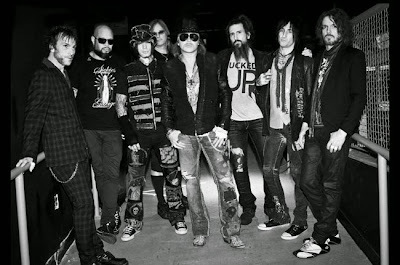 "We recorded a lot of things before [2008’s] 'Chinese' [Democracy] was out," Axl told Revolver magazine. "We've worked more on some of those things and we've written a few new things. But basically, we have what I call kind of the second half of 'Chinese'. That's already recorded. And then we have a remix album made of the songs from 'Chinese'. That's been done for a while, too. But after [the band’s spring residency in Las] Vegas, we're going to start looking very seriously at what we're doing in that regard."